Please be respectful of the new grass, plants, and trees. Everything is still young and getting established, and the plants play an important role in filtering and controlling stormwater. Please don’t pull out grasses, stomp on plants, climb trees, or pull on or break off branches. Please don’t ride bikes on the field. Respect the ropes. These areas are roped off to protect both children and landscaping. Please don’t let students play with the ropes or inside the roped-off areas. Digging is only allowed in the new fossil area. No digging in the field, on the hill, or in the rain gardens. Please return any fossils you find in the digging area for others to discover and enjoy. The soccer goals will continue to be rotated periodically so that the field gets used evenly. Please do not move the goals without permission. Please pick up your trash! There’s a trash can near the parking lot gate and a trash dumpster in the parking lot if the can is full. We also have a blue plastic recycling bin on the playground and a recycling dumpster in the parking lot. We’ve asked DPS if we can get more trash cans. Please help us keep the grounds clean by reminding children to throw away/recycle snack wrappers, juice boxes, etc. The grey rocks help direct, slow down, and filter stormwater. Please don’t move them or play with them. If you stay and play after school, please be prepared to leave the playground promptly when the After School program arrives at 3:30. After School staff also request that children who are under parent care during this time be accompanied to the bathroom by an adult. Thank you for helping to keep the playground safe, healthy, and clean. Por favor sea respetuoso del nuevo pasto, plantas y árboles. Todo es todavía joven y esta en proceso de crear raíces, y las plantas juegan un papel importante en el filtrado y el control de las aguas pluviales. Por favor, no saque las hierbas, ni pise las plantas, ni suba a los árboles, o tire o rompa las ramas. Por favor, no montar en bicicleta en el campo. Respeta las cuerdas. Estas áreas están acordonadas para proteger a los niños y al paisaje. Por favor, no deje que los estudiantes jueguen con las cuerdas o dentro de las áreas acordonadas. Sólo se permite excavar en el nuevo área fósil. Por favor no excavar en el campo, en la colina, o en los jardines de la lluvia. Por favor devuelva cualquier fósil que encuentre en el área de excavación para que otros descubran y disfruten. Los arcos del fútbol continuarán girando periódicamente para que el campo se use uniformemente. Por favor, no mueva los arcos sin permiso. Por favor recoja su basura! Hay una papelera cerca de la puerta del aparcamiento y un contenedor de basura en el estacionamiento. También tenemos un contenedor de reciclaje de plástico azul en el patio de recreo y un contenedor de reciclaje en el estacionamiento. Hemos preguntado a DPS si podemos conseguir más botes de basura. Ayúdenos a mantener los jardines limpios recordando a los niños que tiren envolturas de bocadillos, cajas de jugo, etc. Las rocas grises ayudan a dirigir, ralentizar y filtrar las aguas pluviales. Por favor, no los mueva ni juegue con ellos. Si te quedas y juegas después de la escuela, por favor, prepárate para salir del patio de recreo con prontitud cuando el programa After School llegue a las 3:30. El personal de la escuela también solicita que los niños que están bajo cuidado de los padres durante este tiempo sean acompañados al baño por un adulto. Gracias por ayudar a mantener el patio de recreo seguro, sano y limpio. and all the neighbors, parents, and George Watts alumni who supported this project through donations of time and money. This summer, we hope to install an embankment slide, and we’ll continue with ongoing maintenance. We might need volunteer help with any of the following: watering the field and rain gardens, spreading mulch, mowing, replacing some rain garden plants. Be on the lookout for solicitations for help via the listserv. In the meantime, the playground is open for play (except during summer school hours). Thank you for reminding students and visitors to treat the young plants and new spaces with respect. Happy Summer! 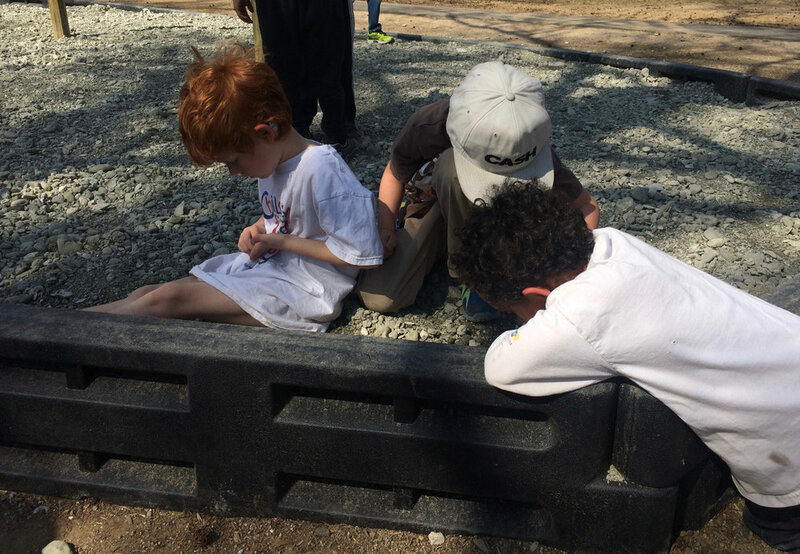 At the end of March we completed the installation of a pirate-themed fossil dig area, conceived as a way to remember pirate-loving second grader Leo and provide a play space particularly amenable to younger children. The three nautical flags at the top of the mast are symbols of his name, L-E-O. We are so excited to see this “pirate ship" finally come to fruition. The fossil dirt came from a mine in Aurora, NC. This is the same dirt that is in the fossil digging area at the Museum of Life and Science. Many thanks to the Watts parents and children who spent many labor-intensive hours over two weekends measuring, digging holes, pouring cement, and shoveling fossil dirt to get it ready for play. Many thanks also to the Trinity Park Neighborhood Association, whose donation in 2014 helped fund this fossil dig and provided a valuable match toward a grant for the whole playground project, which includes many other elements Leo would have loved, including a renovated play field, rain gardens, and a paved basketball court. The fossil fill is IN at the pirate ship fossil dig area at Watts! 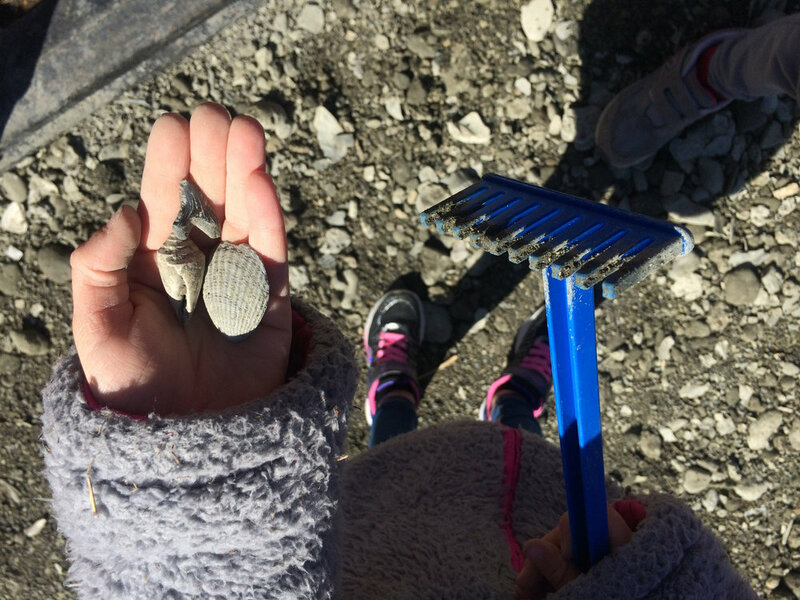 Please remember to return any fossils you find, so that others friends will get the chance to make their own discoveries. We will be installing the fossil dig soon! We got delayed a bit but are back on track and looking at a mid- to late-March completion date. It will be near the orange “bucket” basketball hoop at the back end of the playground. The idea is a ship-shaped area made out of black plastic borders (like the ones around the swing set), with a tall “mast” (wooden post) in the middle, a steering wheel, flags at the top, and benches at the “stern”, all filled with fossil dirt. And we’re hoping to add a telescope, too. We’ll post an announcement about a workday soon, so stay tuned! We will definitely need volunteers to help build it! The Ellerbe Creek Watershed Association, one of our project funders, has generously offered to design and install an educational sign explaining how the rain gardens work. We won a third DOST (Durham Open Spaces and Trails) grant to build 3 bridges over several rocky areas in the rain gardens. We hope to fix the danger currently posed by these rocks by removing as many of them as we can, covering the others with bridges, and for some that need to remain by the outlet pipes, mortaring them in so kids cannot play with them. The hope is that this will allow us to remove the ropes and let the children play in more of the garden areas. We are required by the city to put in more trees and bushes along the back length of the playground. This is a zoning requirement to “buffer” the uses between school and residential. Keep Durham Beautiful donated several maples, lindens and birches already, which we recently planted (you might have seen them, and we roped them off to protect them until they get more established). We still plan to put in the hill slide, in the spot where the hill has gotten worn down from all the kids rolling on it. We are working on a contract with Tributary to do all of the above work, this spring, with minimal interruption to the school day. And, this is all part of our original project budget. We are targeting Spring Break for the work. After that, the project is complete (yay!) and we have no other plans except maintenance, which as always will be an on-going commitment. We are in touch with DPS and Tributary about the two problem areas (the drainage at the grate near the front of the playground entrance and the in the swale at the far end of the field). 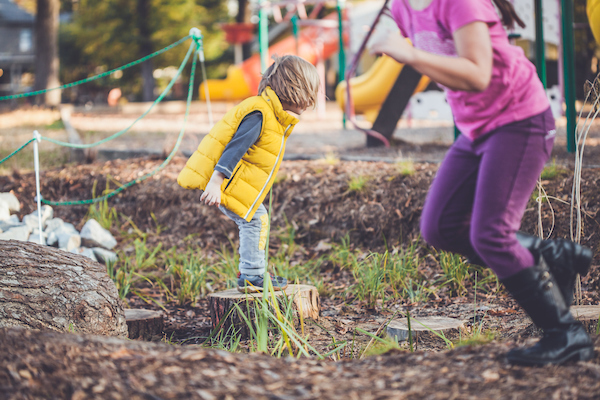 We appreciate everyone’s help protecting the new playground areas by reminding children to respect the roped-off areas and not to dig in, pull on, or damage the grass, trees, and shrubs. Thank you! Thanks to Maria Brubeck for these amazing photos of our newly completed playground! October 25, 2016: We are enormously pleased to announce that the playground is open to students!!! On this gorgeous fall day, children are enjoying the new space and a special popsicle treat. We did a walk through of the playground today with key stakeholders: DPS officials, Principal Crum/Assistant Principal Hanson, our landscape architect, and a city stormwater official. The good news is that the rain gardens all help up remarkably well after Hurricane Matthew this weekend. The bad news is that there is some repair work to be done and that we’ll need at least this week to get the rain gardens fixed and the site ready for students. We hope paving will happen this week: we are awaiting confirmation from the contractor about this timing. We also addressed some design tweaks to make the rain gardens better suited to student engagement. We are incredibly anxious about getting the major work on the playground complete. We hope that the dry weather this week will help us get there! We will let you know if there are any ways to help. As always, we appreciate your patience and support. Last week, before the storm, we planted two rain gardens, and they look fantastic! Thank you to the parents and Tributary crew who worked hard to get these ready before the hurricane. They held up great and are working beautifully! We have continued to work through the delays and damage sustained by our big rain on September 18 and subsequent rainy days over the past two weeks. We have all hands on deck working to get everything completed this week and back open to students asap. Asphalt is scheduled for tomorrow. The impending Hurricane Matthew adds another layer of concern, time pressure, and motivation, and everyone is working hard to get things ready. We are thrilled to announce that the City of Durham has approved our grant request for $10,000. This will pay for some piping work and a required stormwater permit. Thank you, City of Durham! Thank you to everyone who came to ECWA’s rain garden workshop on October 1! The event was well attended, and while the conditions ended up being too wet for planting, the volunteers helped prepare some of the rain gardens for grading & planting. We are loving our beautiful green, green sod!! Sunday night’s big rain was great for the new sod. Unfortunately, the massive amount of rain damaged some of the rain gardens, which were not completed and not ready to sustain the amount of rain that fell. The team from Tributary is working hard to determine solutions, and will work with the contractor to get things repaired as quickly as possible. The continued rain has also delayed the asphalt planned for this week. Everyone is anxious to get the playground opened up to students. We thank you for your continued patience. The progress on the playground is really exciting! Mulch has been delivered and distributed in the rain gardens; sod is down, taking root, and greening nicely; and asphalt should be coming early next week. The first log benches have been placed by the upper rain garden. The playground could open to students as early as next week (with some parts still off limits). We are grateful for all the amazing community support! We are thrilled to see the work get underway! A big component of the playground renovation is the installation of several rain gardens. 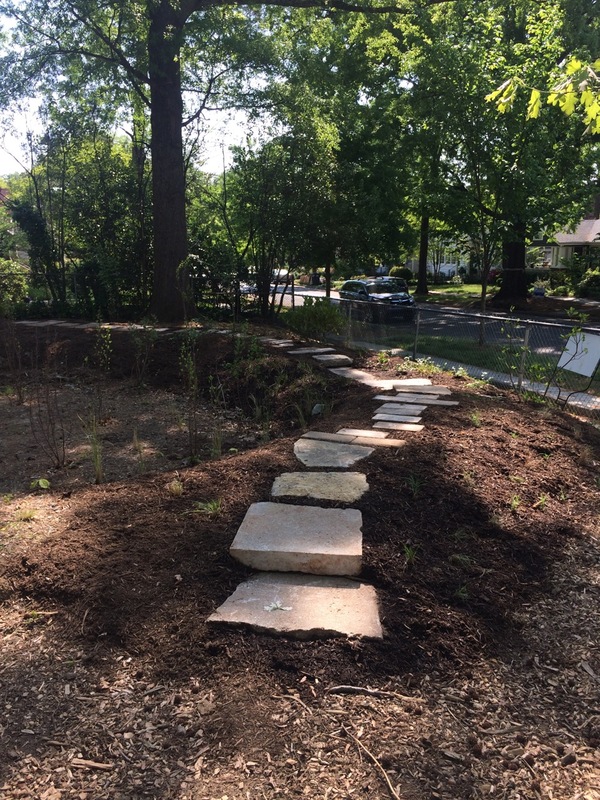 The George Watts PTA has partnered with the Ellerbe Creek Watershed Association, landscape architect Katherine Gill, and Durham Public Schools in the design of these rain gardens to reduce nutrient and sediment runoff and mitigate erosion from the playground. These rain gardens will perform several important functions, including reducing the pollution of Ellerbe Creek, meeting the city’s stormwater regulations triggered by the project, and providing a valuable learning opportunity about water stewardship for the students at George Watts. We have recently learned that in order to install these rain gardens appropriately, approximately 7-8 trees (mostly sweet gums and one persimmon) will need to be removed. This is more than the PTA had anticipated, but we know that their removal has been carefully considered given that the excavation of the rain gardens will harm the trees’ root systems. The trees that have been selected for removal are only those that are necessary for the required stormwater and rain garden work. We have plans to replace these trees with native River Birches. In addition, more than 100 other shrubs and flowering plants will be planted in the gardens around the playground. We regret the loss of these trees, but we hope that their removal is offset by the greater good of a new play field, effective rain gardens that minimize runoff, erosion, and pollution, and the installation of many diverse new plantings in the rain gardens and throughout the playground. We are happy to be working with Eastern Earthscapes as a contractor on this project. Feel free to wave or say hello but remember they’re hard at work, and the playground will remain closed for most of the month of August. Start date: We are told construction will begin on Monday, August 1!! We had hoped that construction would start earlier in the summer, however, complications for a project of this size and complexity are not unusual. It took longer than expected to work through the site plan approval process and other final details with the city . The contractor, Eastern Earthscapes and Construction, will work to get as much done as possible before school starts on August 29. Project scope: We will still be getting a new play/soccer field, half-court basketball court and rain gardens. DPS will also be paving part of the walking trail. This will occur in two phases. The first phase will be the grading, paving and other construction elements, and should take about a month to complete. Phase 2 is mostly plantings, and will be done in the fall. The fossil dig and embankment slide, while still in the plan, will occur in Phase 3, which we hope will follow soon after Phase 2 is complete. 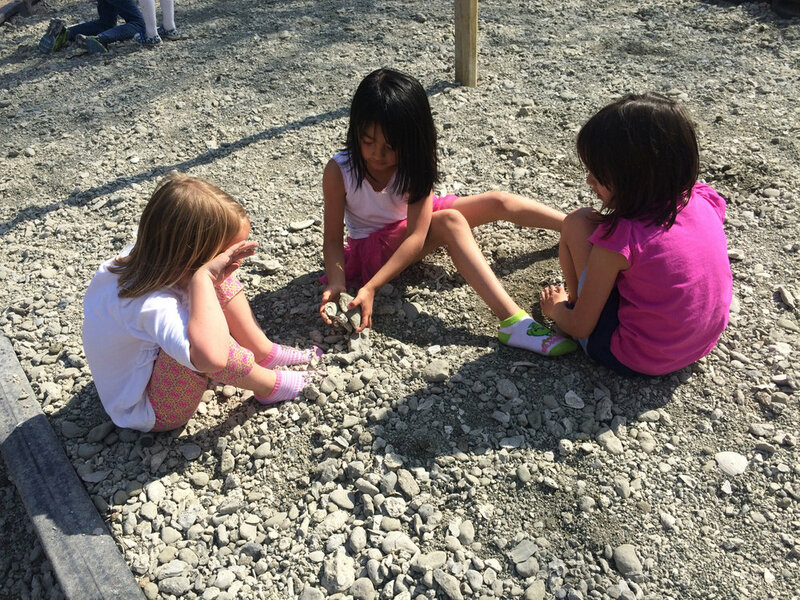 We anticipate the fossil dig will be installed by PTA volunteers. If we encounter unforeseen costs, we may have to delay the embankment slide until we raise more funds. The bulk of the work in the first two phases is being dictated by city stormwater rules and our stormwater grants, and we have been required to put in more piping, swales, soil amendments and plantings than originally planned. These elements cost money and have to take priority. All of this means that we currently don’t have funding for the hard-surface “outdoor classroom” space that we had planned near the playground entrance, or the walkway along the parking lot to Dacian Ave. These elements are part of the original plan and we will continue to explore how and when to complete them. Access to the playground: When the work begins, the playground will be closed for the rest of the summer. As the work progresses, we will work with the school, DPS, and the contractor to figure out whether and how the playground can be used for recess once school begins. Safety is the first priority. We do know that the play/soccer field will need to be fenced off for some time while the new grass takes root. The short-term inconvenience will pay off in the long-term, and we ask for everyone’s patience (Stay tuned to the listserv for an updated location for the August 7 PTA play date). Fundraising: We are continuing to raise funds for this project through grants and donations. All ideas, leads and offers of support are most welcomed! We are grateful for all the help DPS, landscape architect Katherine Gill and Chris Dreps, with the Ellerbe Creek Watershed Association, have provided to get us to this point. We will be in touch soon with concrete ways you can help with this project. If you have any questions in the meantime, please contact Sarah Musser (Sarah.musser@duke.edu) or Annie Ambrose (anniescorza@gmail.com). As construction begins we will post photos and updates…stay tuned! The Leo Bortiri Memorial Playground Project is underway, and exciting changes are coming to the George Watts playground! Details are below. Please watch this space for updates and photos as the project continues. The Timing: We expect the work to begin in Summer 2016 and continue at least through the Fall. Some work might be extended through Summer 2017. The History: The project started after the tragic death of a beloved student and neighbor, Leo, in December 2013. Rachel and Esteban, Leo’s parents, dedicated their Memorial Fund to the PTA, which worked over the course of several months to identify improvements to the playground as the best use of the funds. With the Memorial Fund as a seed, the PTA has raised additional grants and donations to support new playground elements that will honor Leo and benefit all the children. 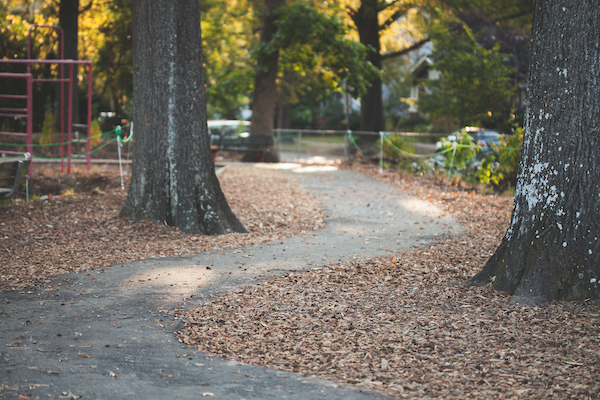 In 2015, the PTA hired landscape architect Katherine Gill, of Tributary Land Design and Build, to create a master plan. In 2016, Durham Public Schools (DPS) partnered with Katherine and the PTA, bringing funds from a past capital campaign, and project management. The Current Status: As of May 2016, we are awaiting site plan approval from the City of Durham, and bids from contractors. The project is currently on track to begin this summer, with a focus on the playfield, half-basketball court, and rain garden excavations being completed by the time school starts in late August. We expect that some work, like planting in the rain gardens, will be completed in the fall. Given the complexities of working with grant funding, some of the work may occur in phases. The Funding: Together with matching funds from the PTA, we have raised over $100,000 for this project. We are so grateful to our generous funders! We need volunteers! Please watch this space and the PTA listserv for announcements about work days this summer and into the fall. We will need help planting rain gardens, building a fossil dig, and more! Interested in making a tax-deductible donation? Donate online, or write a check to the George Watts PTA, memo line: Playground Project, and deliver it to the school or mail it to GW PTA, 700 Watts Street, Durham, 27701. If you would like more information about this project or ways to help, please contact Sarah Musser [sarah.musser@duke.edu / 919-688-1722]. We are excited for the wonderful changes that should be coming to the playground in the second half of this year!